Completely reengineered and designed with professionals like you in mind, the new ATTIX 33 & 44 series dust extractors offer an impressive suction power. With the new generation of best-in-class ATTIX dust extractors you get higher performance, increased productivity and lower maintenance cost. A dual filter solution secures high filtration level and minimizes dust exposure on the HEPA filter. The HEPA filter will capture all small and hazardous dust particles. Need help finding the right dust class? The Nilfisk InfiniClean™ system automatically cleans the filter with a reversed airflow pulse every 15 seconds, so you can keep your mind on the job without worrying about reduced suction power. 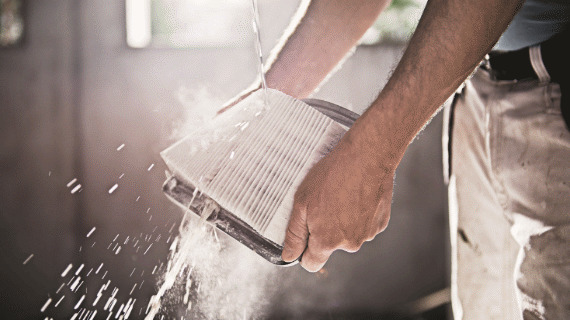 And because of the powerful cleaning pulse, you can fill an entire container without the need for filter maintenance – even in demanding, fine dust applications. Our new primary filter is constructed from a durable, non-stick washable PTFE material that achieves a minimum of 99.9% reliable filtration efficiency of fine dust particles. Because we have spent a lot of time talking to people just like you, we know how important those little details that mean something “just works”, are. That’s why we’ve crammed a number of practical features into every ATTIX machine to make your job easier.